If you’re doing business in real estate, one of the greatest skills you can acquire is the ability to create compelling property listings that sell properties quickly. The idea of “selling” is something that scares a lot of people out of real estate. I used to HATE the idea of being a “real estate salesman” because of all the negative connotations that came with the territory (in my mind, anyway). When I finally came to the realization that selling is a must for any successful real estate investor – I decided to face the issue head-on, rather than running from it. What I eventually found was that selling real estate was actually a lot of fun! After selling several properties in my first year as an investor, I realized I had grossly misunderstood what it meant to promote listings and get properties sold. What I assumed would be an awkward and annoying process, turned out to be a GREAT way to tap into my inner skills as a writer. In my experience, most properties are quite capable of selling themselves, but ONLY IF you’ve priced it right, promoted it adequately and created a listing that clearly communicates why your property is the deal of a lifetime (i.e. – why your buyers would be absolutely crazy not to take advantage of the opportunity). 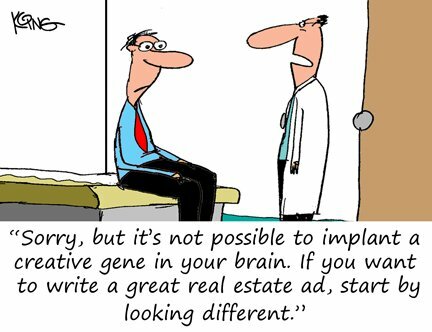 If you want to learn how to write real estate ads well, the fact of the matter is you don’t need to look like everyone else. In fact… looking like everyone else is one of the worst things you can do. If you create listings that blend in with the crowd, people will ignore you. Looking “average” is one of the best ways to be forgettable and NOT get noticed by the masses. That being said, I’ll be the first to tell you that it isn’t easy to think outside the box and be original! It’s not naturally intuitive for most of us to be different/creative and that’s why so many listings are so boring and uninspiring. Don’t get me wrong, some of the well-established tactics out there do work, but most people aren’t clear on which tactics work and why. In order for me to show you how to write listings well, we need to hit the “Reset” button and start from square one. When you’re posting your property for sale on a website with thousands of other listings, it is imperative that your ad has an eye-catching headline that looks different. Your headline is an extremely important part of your listing because in most cases, this will be your only shot at getting a buyer to notice you, so you’d better find a way to stand out from the crowd. Remember, you only have a split second to catch someone’s attention and engage them in clicking on your listing – so this kind of first impression is EVERYTHING… I’m not kidding! Does my headline look different enough to catch your attention? Does it stand out from the other headlines around it? As you can see, it’s not rocket science. You just have to use your brain for a few extra seconds. Try to be just obnoxious enough to get noticed. You don’t need to lie. You don’t need to exaggerate. You don’t need to price it at 50% of market value. You just need to get people’s attention and give them a reason to click on your listing (even if it’s out of sheer curiosity). Note: It obviously doesn’t hurt to include a picture (which will be displayed as a thumbnail) and a good price point to go along with your headline.